After playing Valve’s last flagship multiplayer game, Team Fortress 2, on and off over the past year, I’ve had some of my initial thoughts change since my post earlier this year. A raft of modifications, patches and packs have tweaked the game’s dynamics and bolstered its features such that the game now exudes a certain amount more polish than previously. My earlier speculation that Valve would not have the time (or eventually the inclination) to produce ‘service packs’ for that other classes in the game, after the length of time the original Medic pack took to be released, seems to have been disproved, with two further releases in the intervening period. These packs not only added achievements and unlockable weapons to two further classes, the Pyro and the Heavy, but also added extra game modes and maps. I had originally written this post, long lingering in the limbo of the drafts bin, pointing out a number of weaknesses with the game as it stood. The most recent patch has done much to address those problems, and is a welcome and rather unexpected update, given Valve had denied there would be any releases for Team Fortress 2 until 2009 on account of the amount of work going into their latest release, Left 4 Dead. I’ve gone through and added some comments or changes where necessary, to reflect the recent update, though on the whole this post retains its original state. Whilst I stand by my initial view from earlier in the year that Valve have done a miraculous job when it comes to balancing the various classes, there are still some issues that need to be ironed out, hopefully in future edits and packs. Of course it would be impossible to make a truly level playing field without removing the many classes’ uniqueness, and there will always be situations and maps in which one or another class will show a clear advantage. And it would be unfair to decry Valve’s efforts in creating a balanced game, since there are no classes which go unplayed, and each pack does a lot to reinvigorate them, as well as ironing out some of the more glaring inequalities between them. The welcome improvements to the Pyro class in fact led some players to argue that the Pyro was now overpowered, though the majority of these statements to my eyes came from those predominantly playing Soldier or Demoman, and thus are used to being in a more dominant role. Yet there are still some problems that need to be solved, and until the relevant pack arrives, can detract from game’s balanced playing field. Engineers in particular have a tough call. Whilst they are the backbone of many a successful team, their actions are rarely merited with just reward. I think it would be fair to say that a large proportion of Übers are used against Engineers’ sentry guns, a worthwhile respite for many a team, yet the Engineers’ reward is to have his hard work destroyed by something he can almost never avoid. Similarly Spies can often be the bane of an Engineers’ existence, destroying his teleporter entrances with no one around to defend them, sapping his buildings and leaving them prone to attack from every other attacking class, and particularly if he’s the only Engineer on the team or in his area, killing him directly (even at the expense of the Spy’s life) and leaving all of his buildings unprotected for a period of time. Another source of grief for Engineers comes from the fact that one of his major sources of points, that is to say teleports, relies on his teleporters being in appropriate locations. Since many maps change spawn locations according to the state of play, Engineers often find themselves constantly shifting teleporter entrances/exits if they want to earn points, all the while neglecting their other sentry duties. This particular point of contention will be a difficult one to solve, and it will be very interesting to see how Valve approaches the Engineer in its class update. One simple addition to the Engineers’ current points source would be to award him for ammunition handed out by his dispenser. The tweaks made to the Soldier and Demoman classes in particular mean they are constantly needing a resupply, a fact that could be awarded in addition to the usual health bonus (taking into account of course the common occurrence of Pyros and Heavies standing beside dispensers and firing wildly). There are of course numerous new weapons with which the Engineer could be equipped, beyond alternatives to his regular weapons, such as decoy buildings that explode when sapped, or extra sentry guns of a smaller size, or perhaps even two-way teleporters, the possibilities are limited only by the developers’ imaginations (and bravery). Yet one of the key problems with the Engineer class is its stacking effect. A single Engineer at the moment often has a terrible time dealing with Spies and Übercharges directed against his buildings. With each extra Engineer on the team, however, these problems diminish, as Engineers can help to check for Spies, remove saps placed on other Engineers’ buildings, and generally provide backup that no other class can provide. A concomitant effect is that whilst a single sentry can easily be overcome (and takes time to be rebuilt), two sentries can not only be rebuilt faster (with competent teamwork between Engineers), but also provide greater firepower that may prevent certain classes being able to reach and destroy them even whilst Übercharged. Of course, this issue and many others might be addressed when the relevant class update arrives. Also, whilst certain classes find it difficult to do well in the open playing field of the public server, there are few that are not played in this basis, and the Engineer is a prime example of a class that is not underplayed despite its deficiencies, on the basis that it is an important constituent of a balanced team. Today’s update has certainly gone some way to improving the Engineer’s lot when it comes to supporting the team, though until the update arrives the points issue will probably remain. Whilst upgradable teleporters offer some scope for improvement, their use is still limited by the choice of map, still hampered by potential Spies destroying the entrance (who have also been given a great boon in this recent update), and their cost in terms of time and metal spent upgrading them might outweigh the benefits in most situations. The upgraded dispenser is of more obvious benefit to the Engineer and team in general, 1Particularly as ammunition now has a further heavy duty user in the form of the Spy. and becomes both a prized possession and greater target for the opposition team, though it would be nice to see points being given for dispensing ammunition to teammates. Hopefully this class will gain some further tweaks in a future pack. The other obvious gripe in the game as it stands is the nature of the Demoman. As many players point out, the class is overpowered on a number of levels, particularly when compared to his nearest rival class, the Soldier. In large part this boils down to the class essentially having two primary weapons, in particular with the secondary being preferred by most players as the primary weapon, and in sum having thrice the explosive ammunition than the Soldier. In addition the Demoman can perform maneouvres similar to the Soldier’s ‘rocket jumps’ enabling him to get into hard to reach places. The class is faster than the Soldier, and only marginally slower than the Pyro and Sniper classes, whilst losing little in terms of health points. With his sticky bombs, the Demoman has the ability to defend control points and particularly doorways and other bottlenecks, 2Although the recent update has given other classes at least some defence against laid traps, through having bullet projectiles able to destroy sticky bombs. or alternatively provide backup to a friendly Engineer through mining his buildings as a deterrent to enemy Spies. Against enemy Engineers the Demoman is a particularly bane, with the ability to lob grenades or sticky bombs from an angle out of range of his sentry guns, and with an Übercharge can generally cause more destruction of enemy buildings than any other class. This indirect fire can also be an advantage in normal combat, with the further benefit that the Demoman’s weapons are the only ones apart from the Sniper that do not suffer a decrease in damage dealt over distance. Thus although technically a defensive class, and particularly where maps have severe bottlenecks a very potent one, the Demoman is equally adept in an attacking role. At least at medium range, the Demoman is thus well equipped against the vast majority of classes, with the exception perhaps of the underplayed (and underpowered) Scout. Quite how Valve will approach the Demoman issue remains to be seen. One thing is for certain, however, and that is that they are not short of options. Any number of alterations would help redress the balance, from changing the class’ core statistics (i.e. reduced speed or reduced health), through alterations to the weapons (either changes in damage or ammunition levels), to giving other classes the boost needed to combat him. Personally, I feel one of the simplest modifications to the Demoman would be an increase in the delay that currently exists between firing a sticky bomb and detonating it – and in fact altering the delay such that it is one between the sticky bomb touching another surface and subsequent detonation. The purpose of the weapon is principally to lay traps for other classes to walk into, being a special secondary weapon, but instead is more commonly used as an offensive, primary weapon, with sticky bombs all too often being detonated as quickly as possible, often even in mid-air. His other core advantages described above would remain the same, but the alteration would force players to use the class’ secondary weapon more intelligently, and the primary weapon more routinely. A more open and contentious problem with Team Fortress 2 has to be the presence of ‘criticals’, regular shots that are by random chance upgraded to do double the damage of a regular one. With the increase in the number of unlockable weapons released by Valve that affect the generation of critical shots, it may be the case that in future criticals will become a factored feature of the game, rather than a purely (or at least predominantly) random one. For the time being, one of the most frustrating moments in the game can occur when you are killed by a ‘random’ critical having just built up and used the charge on the Kritzkrieg which would give the person you’re healing a flurry of critical shots. Predictable beaten by random. It’s certainly a good thing that Valve has listened to the community and allowed server admins the ability to turn off criticals without the need to resort to third party mods or plugins, and no doubt this would arguably increase the skill level of the game, though as I wrote in the previous post I still stand by criticals as an important element in levelling the playing field. Which is precisely why the other issue regarding their implementation remains a problem. Predictable criticals obviously add an extra level of skill to utilise that is a welcome inclusion, I’m sure many would agree. The various trade-offs imposed on the weapons which bring predictable criticals to the fold are generally sufficient to prevent their overuse or abuse. Yet random criticals enjoy a sense of positive feedback, in the way in which the chance of firing a critical shot is determined by the amount of damage a player does in a given period of time. I have neither the time nor the inclination to investigate how exactly the statistics are determined, but the general sense is that certain classes benefit more from this effect than others (particularly those like Soldiers and Demomen who enjoy splash damage from their primary weapons), and in particular, players who are doing well are more liable to fire more criticals, leading to something of a runaway effect. There is a natural logic to this manner of execution – players are justly awarded for playing well, and in particular situations this idea is well vindicated. Take for example a situation in which a Soldier approaches a Heavy and Medic from an oblique angle: firing the first rocket at the Medic, who then takes shelter behind the Heavy, the Soldier would be able to fire all four rockets (probably more), dealing plenty of damage but without killing anyone. Yet the increased chance of criticals might just result in the Soldier being rewarded for his efforts. Unfortunately there are situations in which this system can look simply rediculous. Two Heavies with Medics at medium range will probably be able to fire at one another for upwards of 10 seconds before one or other finally succumbs to the onslaught: instead, a more common result is that one of the two is rewarded for the damage dealt in the previous seconds with a barrage of criticals, determining the winner of the encounter on a coin toss. This last complaint is much more of a personal gripe than a complaint with any basis on the game’s mechanics. 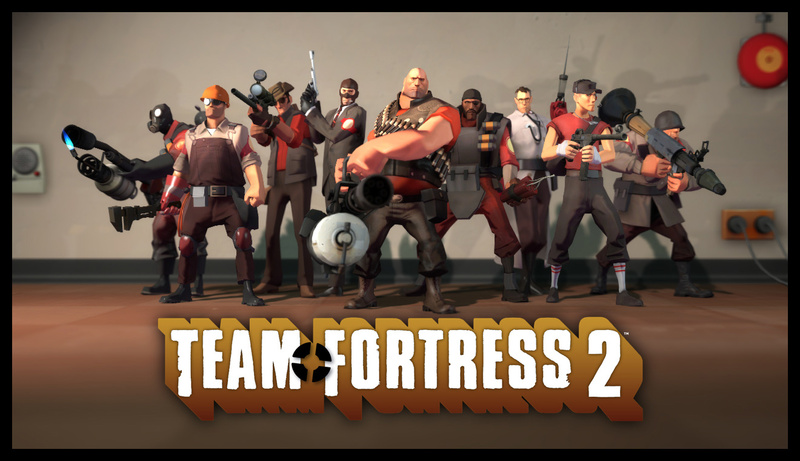 It’s more a question of players’ attitudes to the game than a problem with the game itself, and TF2 is no more guilty of it than any other multiplayer game. Alongside the problems mentioned earlier about balancing issues is the number of players who don’t appreciate the efforts of their teammates. This link pretty much sums up the issue. I’m sure this is a small, vocal minority, but the fact is that basically every server has players who think that Engineers are only useful for building them dispensers and teleporters, that a Medic’s job is to heal them constantly and only ever use their Übercharges on them (as they are obviously going to be MVP) and generally every other class is either useless, overpowered, overplayed, or for noobs. These are the players that constantly mash the button to cry “Medic!” and even have the gall to demand someone else should be their (personal) Medic when the team doesn’t have any. 3Fortunately, today’s update has provided a simple yet effective way for Medics to filter out the demanding players, through indicators of a player’s health status when they call for a Medic. In summary then, since I can only think to elaborate on two major issues, both of which will probably be at least partially remedied in future updates, it seems fair to assume that Team Fortress 2 is a pretty well-rounded game. I can only comment on the game from a public server player’s point-of-view, and consider that this is probably the game’s mainstay anyway. Despite my complaints over balancing issues, there are no classes which go unplayed as a result, and all of the game’s nine classes are often employed, some being virtually essential to a team’s success. With such diversity in the classes, the game has an excellent longevity factor, and Valve’s continued improvements and additions only solidify that appeal. The recent update offers some welcome tweaks and additions that were quite unexpected, and with news that the Scout’s update is in the pipeline for next year, I wish the people at Valve a pleasant festive season and look forward to future TF2 updates in the coming year. 1. ↑ Particularly as ammunition now has a further heavy duty user in the form of the Spy. 2. ↑ Although the recent update has given other classes at least some defence against laid traps, through having bullet projectiles able to destroy sticky bombs. 3. ↑ Fortunately, today’s update has provided a simple yet effective way for Medics to filter out the demanding players, through indicators of a player’s health status when they call for a Medic.